Three years ago I was thoroughly impressed by the eponymous debut of the German traditional doomsters Wheel. Just half-way through the new album Icarus opener Oblivion (There is No Alternative) and I am happy to hear that the Germans undergone no style change. 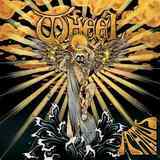 Wheel is still in the business to deliver medium-to-slow paced, cleanly sung and super-emotional classic doom. Just like I said last time, the fans of Epicus Doomicus Metallicus-era Candlemass and Count Raven need to be getting themselves Wheel albums right away. The king of the castle is the band’s vocalist Arkadius Kurek. His weepy, deeply penetrating voice, with Messiah Marcolin’s touches is responsible for a lot of Wheel’s hookiness, and has probably become the band’s trademark. One can probably call some of the Wheel’s slow rolling riffs simple, they don’t venture into great layered complexity, but instead lay themselves out there bare with emotions. If I were to point out the differences between Icarus and self-titled debut, something that struck me no matter how many times I listened to Icarus (and I re-listened to Wheel as well) its songs are somehow more difficult to get into compared with the immediate grab Wheel’s cuts had on me. Bass guitar continues playing prominent role in the heavier chunkier piece They Do for Us, and backs up the brood in the piercing title track. Yet, Icarus songs seem to be quite a bit more diverse, even throughout the single track, giving more evidence to Wheel’s improved songwriting. Flowing melancholy of Oblivion can be shifted to waltzing two-guitar solo. There is only one step from sinister to sensitive in A Daughter’s Song, while harder edge moving mid-Eastern caravan in Misinterpretation of Kadar crushes into utter psychedelia. The closer Frozen Sun keeps it steady with its somber and sorrowful hymn culminating in a wonderful chorus, but such funereal consistency is rare on Icarus, the album is rather full of varying shades of grey. While there is no question I enjoyed Icarus tremendously, I still prefer Wheel slightly. Icarus has its moments with Oblivion and the “I found myself in the passionate eclipse” Eclipse. The prowling bear gait of the riffs in that song coupled with a memorable chorus line is a signature Wheel, the band I can strongly recommend.